In Thai language, nam tok is a waterfall. 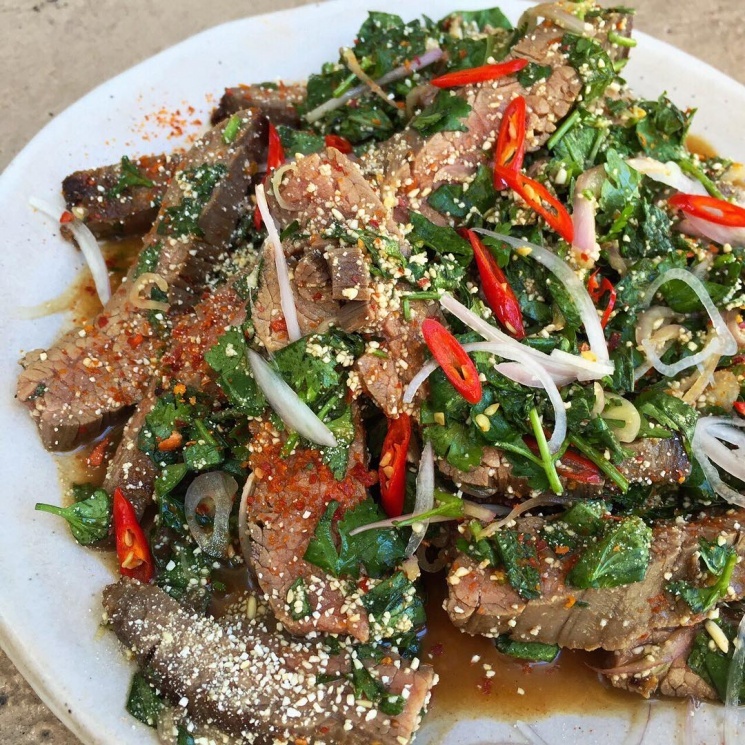 This dish is usually cooked using a barbeque (the juices drip onto charcoal hence the name waterfall) but you can fry or broil the beef just as well. It should be cooked rare to start with. See our street vendor video lower left, a sidewalk chef prepares it. We also offer: instant nam tok mix and Mama instant namtok noodles. 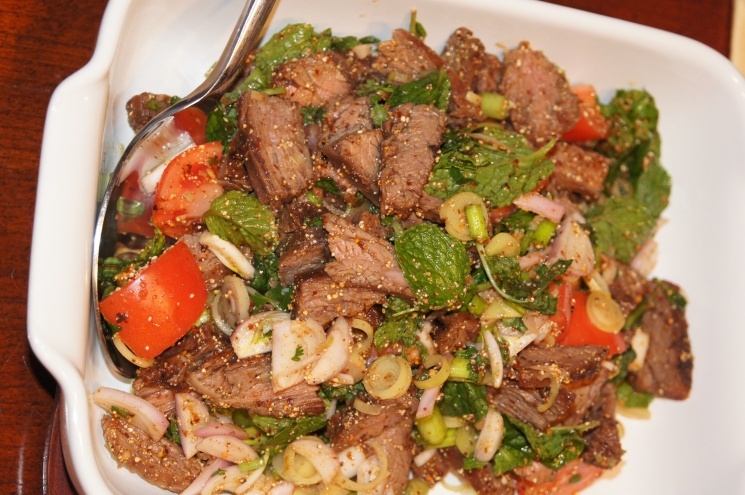 A great dipping sauce to serve with this beef is made with our Namprik Thai Tae. You need a 1 pound steak, cut fairly thick. Mix the marinade, coat the steak with it and marinade it for at least 3 hours. Mix the marinade, coat the steak with it and marinade it for at least 3 hours. The steak is then barbequed, broiled or grilled until on the rare side of medium rare, cut into half inch thick strips and the strips cut into bite sized pieces. The meat can be kept cool until just before you want to eat. In a wok bring a little oil to medium high heat and add the strips of beef, immediately followed by all the remaining ingredients. Stir fry until heated through (about a minute). 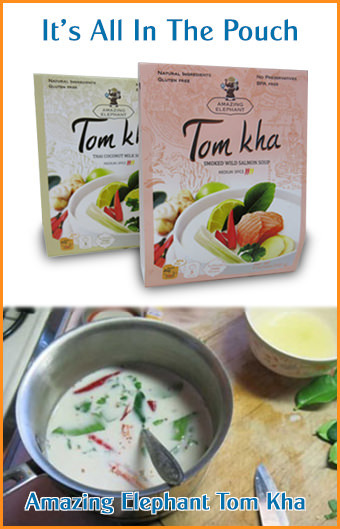 Serve with Thai sticky rice, or as part of a meal with pad Thai and a soup such as tom yum koong (hot and sour shrimp soup). Enjoy. This is one of our all-time favorites. When my I had this at my Thai friend's birthday party, the beef was very, very thin sliced, and very rare...not raw, but rare. Other than that, this recipe is the same as how he prepared, except he told me that the rice cooked for the khao koor should be cooked until black, and then ground up. He also used more mint, shallot, and cilantro. It was absolutely so delicious! The best NomToks Ive ever had (in SE asia and the US )used a higher quality beef, seared until cooked- with a fair bit of raw in the middle...Sliced fairly thinly, and then added to the rest of the ingrediants after they are cooked. The beef in Thailand is not of the best quality, and actually not often found in many places. (Beef/ Cattle are expensive, slow growing ). 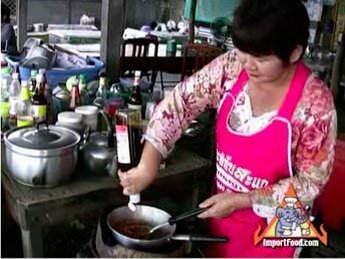 Often in Thailand the beef was usually fried. I have had it raw before in Phitsanulok. THERE'S NO RULES IN COOKING.YOU CAN CUT YOUR MEAT IN ANY DIFFERENT CUTS IF YOU LIKE. I am half Thai and my mom is a Thai chef and I've never seen this dish served with raw meat. I'm sure there are places in Thailand that offer it, but that would definitely not be traditional. The "remaining ingredients" are for a sauce that is served on the side, so each person can add as little or as much as they like (usually it's quite spicy). Can ship fresh beef to Rangoon? The Thais sear the beef over charcoal and often the beef isn't the best quality and often it is buffalo but always should be fresh.